Yesterday a pheasant rooster turned up at our bird feeder and gorged himself for more than an hour. Our house is about 400 yards from the nearest cover any self-respecting pheasant would consider. Surely a sign the Upland Apocalypse is upon us. I’d hoped we’d see a turn toward some burn-off so I might get out one more time before the end of January, but with the continued frigidity and snowfall it looks like the fat lady has indeed sung. I’m looking for a fork to stick in myself. We’re done. I worry the birds are, too. Done for, more like. I keep hearing about herds of chukar on the road and gangs of road-sluicing morons taking advantage of the desperate birds. If there’s any hope for some leftover breeders, the road killers are doing their part to prevent that from happening. It’s a shame we’re looking at yet another upcoming season of super-low bird numbers. And Fish and Game, in their brilliance, have rejected the many requests by sportsmen to end the season. I’m not a biologist and don’t know a lot about over-winter survival for chukar, but it only stands to reason that adding more mortal pressure to an already maximal environmental stress on a species isn’t a recipe for success. I don’t get it. I’m sure one of my smarter readers can clue me in on this. I hope I’m wrong. I hope we see some good numbers of birds in the fall. If we do, I’ll be even more impressed with these feathered phenoms. But I’m preparing for another disappointing year. In the meantime, I have lots of amazing memories of this great — but shortened — season. I hope you do, too. Google chukar populations Christensen. He did surveys and work and has some good reads on it. There are other research papers on chukar too. Breeding and hatching conditions and the health of the hen going into spring plays a huge role in nesting. Hard winters can affect the hens health obviously. As for those stacking up road chukar, have some pride and concern for the population next year please. 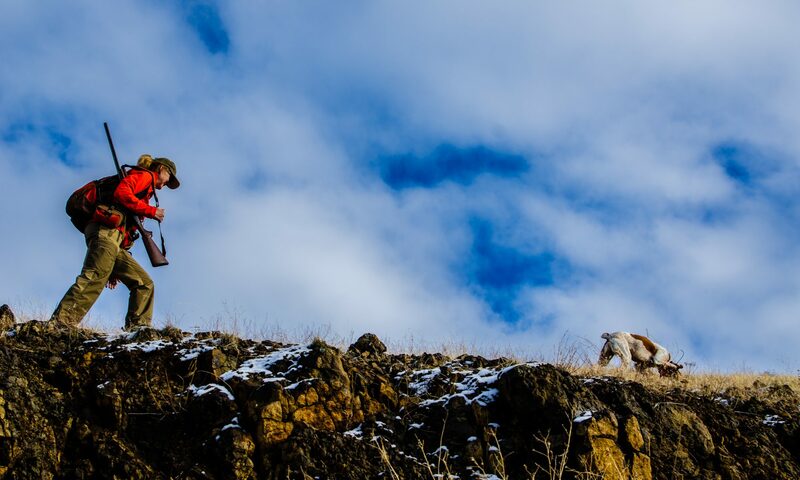 Chukar hunting is about the dogs, exercise, friends and good times testing our limits as people. Chasing covies off the road into 10+ inches of snow and then hunting them for 2 minutes from a road is not really hunting. I call it getting. Few years ago two persons were caught with 78? chukar from road hunting in deep snow. That’s foolish and greedy. Please Respect all game animals every year and especially in these conditions around the west this year. Hunt them as they were ment to be pursued, with respect, not from the truck window. I notice having moved recently to Washington State that the fish and game authorities respond quite quickly to changing environmental conditions. They lengthen and shorten seasons with great flexibility. Maybe Idaho simply had a different political culture or maybe science in Washington State isn’t dissed. Who knows? Maybe its the bird brains. It is interesting that Fish and Game is not acting, because when they changed the seasons to open Chukar during January, they assured the hunters that the season would be promptly closed if severe winter weather warranted it. At the same time, I don’t think that slaughtering Chukar on the few areas open now to motor vehicles is going to seriously affect the survival of the species in a meaningful way. It is more a social or ethical issue to me. If it was a question of deer starving in view of wealthy suburban homeowners Fish and Game would waste the money to try to feed them so the homeowners would not have to see the suffering the construction of their homes caused. React to views of Chukar hunters? Not likely. I think you underestimate how devastating this winter is going to be. Sometime in the 80’s (about 1985 I think) we had a winter sort of like this. However it was a little different in that the cold lasted longer, but the snow was not as deep and also was more crusted, and there were some areas on south slopes where it melted off. Chukar were almost eliminated from vast areas, and the season in following years was shortened. Squaw Butte was closed for a year or two. Chukar hunting was virtually nonexistent for two years, and poor for two more. I think the soft deep snow this year will be more harmful. We have close to a foot of snow ­ and are headed out for a long ski by the river. Thanks for the nod to hope, Geoff. I’ll look up compensatory mortality (and maybe compensatory morality while I’m at it). Good point Geoff. I don’t know what’s right or wrong when it comes to the effects of hunting birds when weather conditions are severe. I know my father always discouraged me from hunting them in such conditions. As a adult hunter this makes getting out and hunting chukar ,for me , like doing something Im not suppose to be doing. So I refrain from doing it. I’ve been a bird hunter since I was eight years old (40+ yrs)and have seen many a severe winter on these birds and I am amazed at their ability to survive and rebound their populations. Chukar are an exceptional breed of bird. Ground sluicing road birds? I resemble that remark! So that’s how you rack up all those dead birdie photos on UJ!! On a serious note, there is a recent utube video (Jan 7) of a couple young clowns at Brownlee Res. killing from the road. They even video themselves loading their guns in the truck. Somebody needs a smack on the back of the head. Sweet pics Bob and try not to go postal hunkered down. Thanks, Bill. As you might have seen, I posted that video on my blog, and within a day or two they’d removed it from YouTube.